Share the headline of that chart with everyone on your marketing team – landing pages found to be more effective element to test than subject lines. Sure, we all test subject lines (well, 72% of us anyway), because it’s just so darn easy. 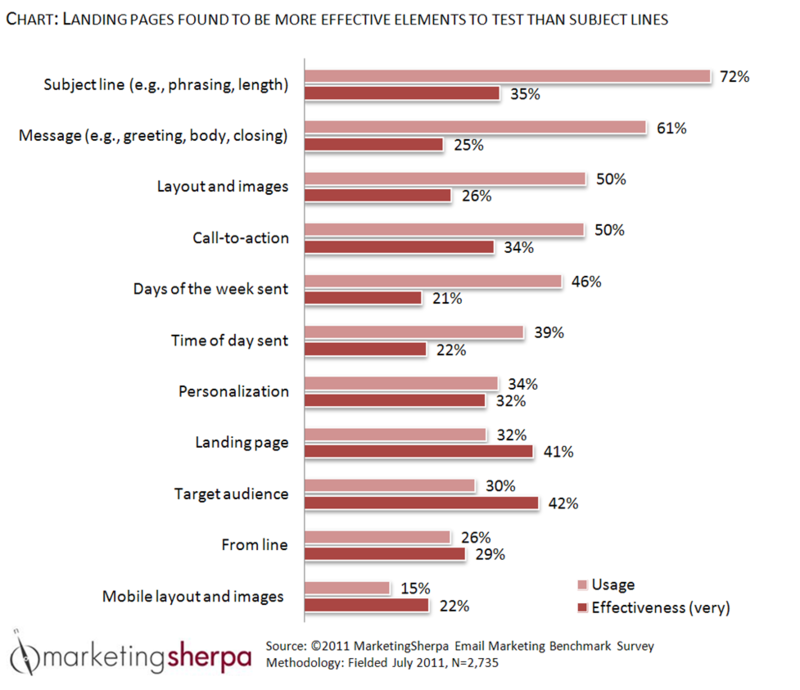 Yet, only 35% of marketers consider subject line testing to be very effective. However, only 32% of marketers test landing pages (you mean I have to try to get something through IT? ), while 41% of marketers consider landing page optimization to be very effective. And on the face of it, it makes sense. The deeper you test in your funnel, the more of an impact you tend to have on the metrics that really matter, like revenue. So while subject lines might increase your open rate, landing page optimization helps you increase conversion for more valuable metrics such as lead capture or actual purchases. So, buy a few pizza pies (or zombie brains or whatever it is they eat) and some Mountain Dew for the nice folks over in IT, and start planning a few landing page tests. Nice post! Thank you for sharing these stats. I find it interesting that target audience is considered slightly more effective and is slightly less used than landing pages. Our email advertising platform will automatically target to the people most likely to respond to an offer, so we also find that type of testing very effective. Were these results for Consumer or BTB campaigns? Hi Joe, great question! The results are based on 2,735 marketers who participated in the MarketingSherpa 2012 Email Marketing Benchmark Survey. Some further insights on the participants can be found on page 2 in the free report excerpt. A link to that free excerpt is provided in the opening of this article. Check it out and happy testing. It completely makes sense as you state, but the barrier of having to make changes that requires more effort is what stops many marketers going ahead and doing so. This is why so many elements of digital marketing need to work fluidly together if they are to succeed.